Join in the fun on LC Day on Friday, October 17 as we celebrate the myriad classes and extracurricular events that students enjoy in a typical 24-hour period. This year we planned LC Day to coincide with Homecoming to encourage more alumni participation. Check the full schedule of events for Homecoming. We want students, alumni, faculty, staff and friends to let us know what is happening during their day, no matter where you are. You can post photos or short videos directly to LC’s Facebook page. 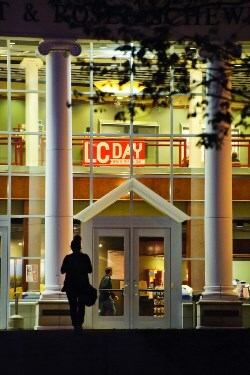 If you Tweet or use Instagram, use the hashtag: #LCDay. Keep up with all our social media on LC Day. “Hornet-2-Hornet College to Careers Conference,”a series of panels with alumni from a variety of disciplines talking about their work experience from 3 to 4 p.m. Friday, Oct. 17. Students have a chance to network afterwards. The reunion of Melting Pot, an 80s band of alumni, which will perform Friday, Oct. 17 at 6:30 p.m., on the third floor of Drysdale Student Center, and Saturday, Oct. 18 at 9 p.m. in Memorial Ballroom. Check out this Critograph article on the band.